Kumtor is an open-cast gold mining site in Kyrgyzstan’s Central Tian Shan mountain system, situated in the mountains' central permafrost massif which reaches heights of 3800-4400 metres above sea level. Commercial exploitation at Kumtor began in 1997. The site is 100% owned by the Canadian gold-mining company Centerra Gold, which manages it through its subsidiaries, the Kumtor Gold Company (KGK) and the Kumtor Operating Company (KOK). Kyrgyzstan, in its turn, holds roughly 33% of shares in the company through its OJSC Kyrgyzaltyn Joint Stock Company. The gold reserves at Kumtor are assessed as amounting to 716.21 tonnes, of which 316.57 are in open cast mines and 399.64 underground. We asked Kyrgyz ecologist Kaliya Moldogaziyeva to tell us about the environmental threat to the area from the mining operations at Kumtor, the new amendments to Kyrgyzstan’s Water Code and the future of the region’s water resources. Moldogaziyeva worked with state commissions on issues concerning Kumtor in 2005 and 2012, and was deputy head of an interagency commission on the same subject in 2011. 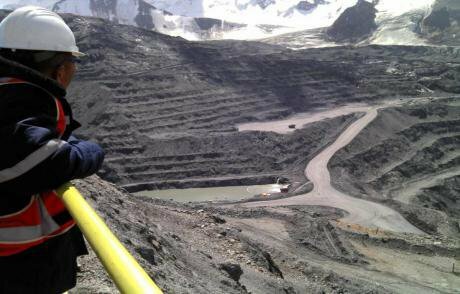 Could you explain to us how activity at the Kumtor mine affects Kyrgyzstan’s water resources? The Kumtor mine is situated at the sources of the Arabel and Kumtor river system, in an area at the centre of the glacier and river runoff of Central Asia’s most important waterway, the Naryn river, which flows into the Syr Darya. The mining site includes a quarry, a gold-processing plant and other infrastructure elements. The mining is an open-cast operation, with 14-17 tonnes of explosives used daily, and the ore is processed using cyanides. The construction of the mine workings contravened Kyrgyz law from the very beginning. At the first stage of the work, KOK management started dumping waste on the Davydov glacier, which was forbidden under Rule No.79 of the country’s Unified Safety Regulations and its law “On Water”. More than a billion tonnes of rock have been removed from the quarry and dumped, as well as 77 million cubic metres of glacial mass – the equivalent of 60 billion litres of glacial water. The volume of dumped rock and cyano-containing tailings in the tailing storage areas will grow, and all this dumped material will remain forever in the headwaters of the Naryn river, requiring continual monitoring and technical maintenance, even after the closure of the mine, which is slated for 2026. Why were amendments made to Kyrgyzstan’s water code at the end of 2017? “The full and conclusive mutual release and settlement of all existing arbitration and environmental claims, disputes, investigations and court decisions, as well as the release of the Company and its daughter subsidiaries from future claims on the same grounds as the existing environmental claims resulting from approved activity”. In other words, this agreement sidelines the whole question of compensation for the environmental damage caused by the company over the many years of mining at Kumtor, as well as the destruction of the Davydov and Lysy glaciers. Any activity affecting the speeding up of the glacial melting, using coal, ash, oils or other substances or materials that could affect the state of the glaciers or the quality of the water contained in them, as well as activity connected with ice harvesting, other than on the Davydov and Lysy glaciers, is forbidden. These exceptions do not apply to previous operations on these glaciers. But perhaps the glaciers are melting because of global warming, and not the mining operations? Experts engaged by the Kyrgyzstan government are indeed arguing that glaciers are melting all over the world and that the Kumtor glaciers would have melted by themselves. No one, however, has mentioned the fact that the rocks overlying the gold-containing ores were stored on the glaciers to a height of 90 and 120 metres and mixed with them, so the meltwaters already contained sulphates, heavy metals and other toxic substances that got into the waterways. This was confirmed by the conclusions of the Kumtor State Commission (2012-2013) on which I worked: the concentration of toxic substances in sediments had indeed increased. Environmental protection laws, and in particular the “Law on Water” and the “Unified Safety Regulations” have been being infringed since the start of the construction of the Kumtor mine. Glacier No. 359 in the Catalogue of Glaciers of the USSR was completely destroyed, while most of the Davydov Glacier was ruined when the mine was already in operation. The situation is now under control, but by the end of operations there, there will be 1.7 billion tonnes of waste, mixed with glacial masses, and all the problems will lie at the door of Kyrgyzstan’s government and population. Looking ten years ahead, we will see a reduction in water resources because of global warming, and theses resources will, in addition, be irreversibly polluted, and no injection of government funds will be adequate to the task of removing the polluting substances. What is the Kyrgyz government doing to conserve the water resources at Kumtor for the future? Government ministers have been insisting that without the legal amendments, Kumtor will turn into a catastrophe. But it was the systematic infringement of environmental protection legislation during mining operations that has caused the present state of affairs. And instead of demanding that the company clean up its act, our highest government officials and heads of key national agencies propose legitimising these irregularities. Jeopardising Kyrgyzstan’s water resources for the sake of extracting mineral deposits is short-sighted. Meanwhile, according to the law “On Strategic Objects of the Kyrgyzstan Republic”, structures pertaining to water management and waterworks, including glaciers, natural lakes, river, hydro engineering structures, reservoirs, dams and pumping stations are all considered Strategic Objects of the country. In the case in question, the Kyrgyzstan Republic’s government and parliament are ignoring this law. Centerra’s environmental report for 2016 includes a statement to the effect that the company and its subsidiary KGK don’t consider that the water code applies to the Kumtor project. The corporation, in other words, is laying down the law to the Kyrgyzstan government and parliament. This same strategy plan quotes World Bank data stating that the countries of Central Asia will be the second most affected world region in terms of glacier loss, including the loss of the Tian-Shan glaciers in Kyrgyzstan. The effect of the economic activity in mineral management and agriculture, as well as hunting and poaching, environmental pollution and lack of ecological accountability could all add up to an irreversible state of affairs. The new legal framework has created a basis for environmental protection and the conservation of the glaciers. But while mouthing the national strategy for sustainable development and the importance of environmental safety and compliance and the conservation of the glaciers, our government is changing the law and, among other things, introducing amendments in the water code which will allow the destruction of the glaciers at the Kumtor mine. By our ancestors in the Ala-Too Mountains”. What is Kyrgyz civil society doing to stop the amendments going through? In November 2017, then president Almazbek Atambayev signed off the “Law on Amendments to the Kyrgyzstan Republic’s Water Code”, passed by the Jogorku Kenesh after three readings, although members of the public sent him an open letter asking him not to sign that particular draft. Independent experts and civil society campaigners are still engaged in trying to have the amendment revoked. The “Democracy and Civil Society Coalition” NGO even brought legal action against the Jogorku Kenesh, on the grounds that parliamentary regulations were breached when the amendments were passed; there was no quorum and MPs voted for one another, which is forbidden when a law is being adopted. Its case was however thrown out by the courts. A group of rights campaigners and environmental specialists is supporting the Coalition. After a consultation with me and ecologist Oleg Pechenyuk , the NGO sent a request to the Jogorku Kenesh to have an analysis of all the requisites of the draft law and its regulatory implications carried out. They received a reply: there has been an expert appraisal of its legal implications, but nothing about appraisals in terms of the ecological, civil and human rights, gender, anti-corruption implications which are required when laws are being passed. The amendments have obviously contained numerous irregularities. The Coalition is continuing to work on its legal case. Ecologist Gulnura Beleyeva and I are intending to work with the environmental protection community to raise awareness of the work being carried out by the campaigning group and to develop an action plan for the future. It is essential to have the previous version of the water code reinstated, without the exceptions allowing the destruction of the glaciers that are an important source of water not only for Kyrgyzstan but for the whole of Central Asia.